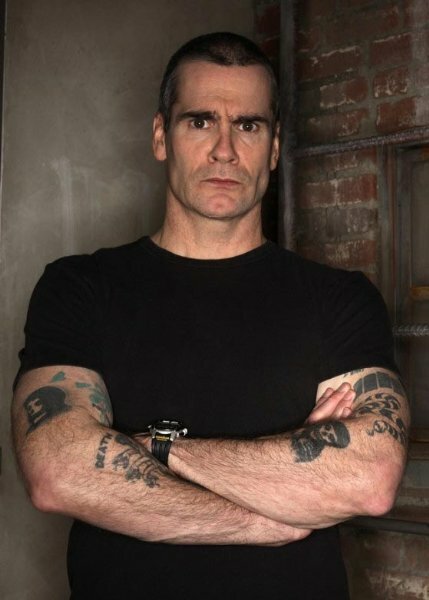 The main question on one’s mind upon hearing about Henry Rollins‘ spoken word tour maybe well be: what exactly is a spoken word tour, and is it filed with sub par haikus? The answer, at least in this case, is a thankful no. This spoken word show starts out with the comedic stylings of Bruce Griffiths, a long haired man who stands behind at the microphone before telling what becomes a very long series of one liners. As is the nature of those jokes, some are funnier than others. Some are not funny at all. Does a two and a half hour show need a support act? Especially if it’s this kind of opening, the answer is a definite no. Entering to much applause, Rollins himself is clad all in black. He stands still yet poised for action as he delivers his stories, for that’s what his show is: a collection of stories, some happy, some sad, with the overarching message that we, the audience, can and will change the world. There is something for everyone here. Fans of Rollins’ music in punk band Black Flag will hear tales of his early days in the band, being poor and touring America constantly; then visiting Australia for the first time and experiencing the delicacy that is Vegemite. He touches on American politics and the American Right’s war on women, and acknowledges that while his country is not perfect, his countrymen are good people – furthermore, this is true of all the places Rollins has visited. His travels make up a vast portion of the stories told, for Rollins, with a self-stated lack of apathy, travels extensively. It is the people he meets that keep his faith in the world, for no matter where they live they remain, well, people. They like jokes, they perform rituals, they have fun; and it is these similarities which underscore Rollins’ message: we are all people, and we can do good things together. Of course, the wrong delivery would make this message sound preachy – let’s face it, no one wants to spend over two hours being told that they can do better. That’s not how it is here. It’s just a collection of stories that can impart a little wisdom and a little motivation to do something good. Some might be inspired to travel and see the world, some might fight poverty, and some might simply want to reduce their carbon footprint. Some might do nothing at all. No matter. You’ve just heard a passionate man talk about his interesting life and that is never a bad thing. Henry Rollins’ The Long March tour continues around Australia until May 12. This entry was posted in Arts and tagged henry rollins, the long march. Bookmark the permalink.